In this guide you will learn how to fix the error VLC is unable to open the mrl […] check the log for details. First, we must distinguish between two cases: streaming videos from YouTube, and streaming videos from other sources. If the problem is that you are unable to open a YouTube URL, you will need to adopt a specific solution. YouTube transmission protocols changes over time, and these changes sometimes break the YouTube module embedded in VLC, making it unable to open some (or all) videos present on this platform. Whenever it happens, the VLC developers try to fix the error as soon as possible, but the fix (once implemented) is not immediately released within the public version of the program. First, try to update VLC to the latest version, downloading it from the official website. If, despite that, the problem is still present, you will need to download a small file from the development branch of VLC, and to overwrite the corresponding one in yours. If you carefully followed the instructions, you will be asked to overwrite the youtube.luac file in the destination folder. 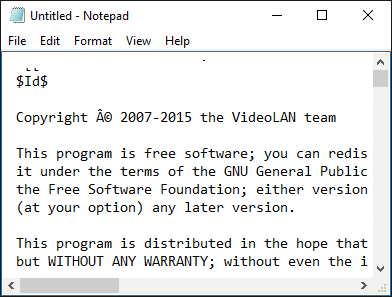 Confirm, and you are done: just enjoy the streaming of any YouTube video inside VLC! Whenever the problem comes back due to further YouTube protocols changes, simply repeat the process, assuming that the developers have already fixed the error with the latest version of youtube.luac file (it could take some time). Finally, remember that the execution of YouTube videos may hang if you try to jump from a point of the stream to another, so it is usually better to start the video from the very beginning, pausing it when necessary. In this case, the error may be due to several factors. Let’s see together the most common ones. Only YouTube and a few other exceptions work in VLC simply entering the link to the page containing the video. 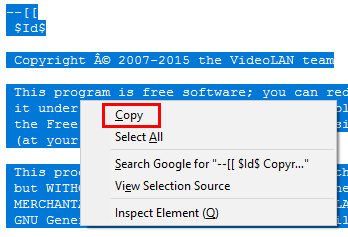 In all the other cases, you will need to get the direct URL of the video by using the appropriate tool (such jDownloader), or by hand (for exemple, using the developers provided by your browser). Sometimes videos are removed or moved to another location by the owner. Make sure that you are using the latest, updated URL to the desired resource before proceeding. If you’re using a firewall, make sure to grant to VLC the permission to run remote content (the procedure varies depending on the installed firewall). Remember to check the integrated firewall of your router as well, if present. If the video you are trying to open with VLC is hosted in a private section of a website, or its URL has been taken using a PC or an IP address different from yours, you may not have the required permissions to view/download it on your computer. To understand if the error you are experiencing falls into one of the aforementioned cases, you could try to get some hints by opening the video URL in your web browser, instead of using VLC. You are forbidden from streaming or downloading this video because it is reserved for a person with an IP address different from yours. So, in this example, we are fallen in the last case listed, i.e. execution of unauthorized video stream.